Bicycle advocates formed a human-protected bike lane along the 1300 block of Pine Street in April after another death of a cyclist. This Friday is Bike to Work Day, an effort by the Bicycle Coalition of Greater Philadelphia to encourage more safe, accessible ways for cyclists to commute and cycle in Philadelphia. “Commuting by bike is a great way to get to work, stay healthy, relieve stress and enjoy the scenery,” BCGP says of the event. A large group ride will begin at 8:30 a.m. at the Penn Museum and end at Dilworth Park with a 9 a.m. press conference that will highlight the ways in which “efforts to achieve safety for all road users is challenging but critically important,” according to the event page. Guests include a number of representatives from City Council and Health Commissioner Tom Farley. Interested participants are being encouraged to register for the event here. 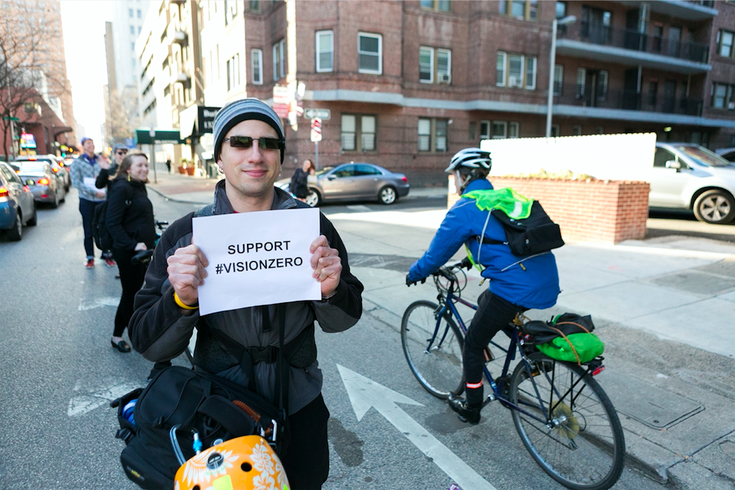 This comes at a tumultuous few months for bikers in our city — just last week Pablo Avendano, 34, a beloved community bike messenger was killed while riding on Spring Garden Street, one of Philadelphia’s most-used and most-accessible bike lanes. You can see the GoFundMe page started to support his family here. On Wednesday night, hundreds of bikers braved the rain for the Ride of Silence to honor cyclists who have lost their lives to vehicle crashes in the Philadelphia area. There have been 11 people throughout the Delaware Valley who lost their lives riding a bicycle over the past 12 months, according to BCGP.